Floppy and CD-ROM version. 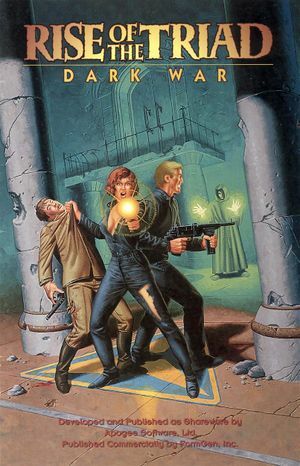 Originally released as shareware titled Rise of the Triad: The HUNT Begins. See: Version differences. Pre-packaged with DOSBox. Also available in 3D Realms Arcade Collection. Includes 'Extreme Rise of the Triad'. Pre-packaged with DOSBox. Includes 'Extreme Rise of the Triad'. Pre-packaged with DOSBox. Also sold as part of The Apogee Throwback Pack. 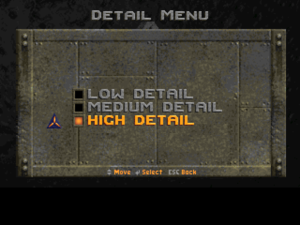 Rise of the Triad: The HUNT Begins is an exclusive episode released as shareware in 1994. 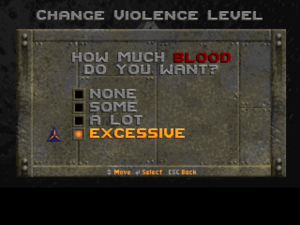 It is included in Rise of the Triad CD-ROM version. It was also included in the Triad Powerpack, a commercial expansion for the floppy version. Rise of the Triad: The HUNT Begins Deluxe Edition was a commercial re-release of The HUNT Begins with 6 exclusive levels. These levels were later offered for free download and are also included in the digital versions. Rise of the Triad: Dark War is the full game. The CD-ROM version (also called Super Triad) adds 10 multiplayer maps and a random level generator. It also includes the shareware episode The HUNT Begins. Commercial expansion for the original floppy version, bringing it on a par with the CD-ROM version. Included with all digital versions of the game. Available for free. Included with all digital versions of the game. Can also be downloaded from the official website. v1.3 is the latest version. All downloads for the game can be found on official game site. WinROTTAPI Windows GDI A new port by the WinROTT/WinROTTGL developer with 64-bit support, using native Windows API. WinROTTGL Windows OpenGL A successor to WinROTT using OpenGL. Includes further fixes and improvements, supports up to 1920x1080 resolutions, texture filtering and sharpening, transparency, mp3 music and parametric reverb. Requires GLgraphics. WinROTT Windows DirectDraw A source port developed for Windows XP. It includes bug fixes, supports up to 1024x768 resolutions, mouselook with crosshair, and adds bots to multiplayer. May have issues with modern systems, since development stopped in 2005. SDLROTT Windows, Mac OS X, Linux An SDL port of ROTT which includes 64-bit support and features/fixes from WinROTT. Linux and Mac users need to manually compile or look through the distribution's repository, although a (slightly dated) OS X build is available here. The Windows binary files are based on the Development version and requires SDL.dll and SDL_mixer.dll in order to run. Rehab Project texture pack contains 71 enhanced textures. Requires WinROTTGL. Configuration files are CONFIG.ROT (options), SOUND.ROT (sound) and BATTLE.ROT (multiplayer). Savegames are labelled ROTTGAM*.ROT. High scores are saved in SCORES.ROT. Use WinROTTGL. Only 1920x1080 supported. Use one of the Ports. 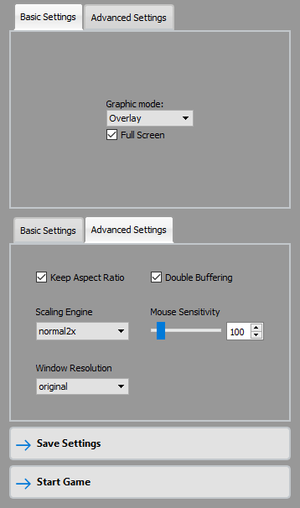 In-game mouse button map settings. 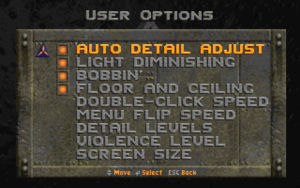 In-game joystick button map settings. Use one of WinROTT Ports. ↑ The shareware release was December 21, 1994. This date refers to the full retail release. ↑ 2.0 2.1 File/folder structure within this directory reflects the path(s) listed for Windows and/or Steam game data (use Wine regedit to access Windows registry paths). Games with Steam Cloud support may store data in ~/.steam/steam/userdata/<user-id>/358410/ in addition to or instead of this directory. The app ID (358410) may differ in some cases. Treat backslashes as forward slashes. See the glossary page for details.